This time to the Lake District. Why the Lake District? Well, other than its close location to my home, I have been reading up recently all about the life and times of Beatrix Potter, and I wanted to seek out where she lived and where the National Trust was born. I had of course seen the film, it was mostly filmed in the Lakes, but some of the inside shootings that were representing Beatrix's life in London were filmed on the Isle of Man. So, another connection, although I really dont think Beatrix Potter her self ever visited the Island during her lifetime. But first... Tina and I were on this tour, Tina is studying with the OU, and had to attend a class run by them, and as travel is costly, she planned to include a trip to the North East where her family reside, so we decided that Tina would travel separately by car, and I would meet her at the B&B in Hawkshead on the Saturday. I was rather relived by this, as I had planned to do a bit of selfish endulgance for myself, as I wanted to check out a lot of Beatrix Potter's haunts and homes, and I wasn't 100% convinced that Tina would find this part of our riding much fun. This trip worked out well to both of our advantages, Tina could do her OU work, and I could spend HOURS pouring myself over the life and times of Beatrix Potter. Leave IOM on the Thursday meet Tina on the ferry. Tina speeds off to the great Motorway unknown for family and OU, and I pootle off much slower along the A6 to Carnforth, where a quick left turn takes me into the lovely slow pace of Silverdale and an area I know well. My brother lives here. He was sadly made redundant from his University job, and is about to return to the IOM to live. 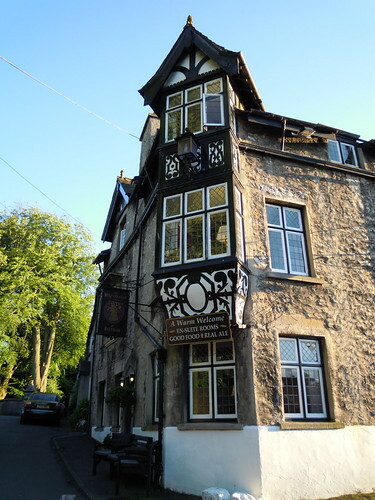 Although I could have stayed at my brothers cottage one last time, I wanted to kip at the Youth Hostel in Arnside – my intention was to stay here, then off to Windermere Youth Hostel the following day nice and early. But not before a fine meal at the Wheatsheaf in Beetham first with my favourite brother. When visiting an area its nice to research it a bit. And this came up! 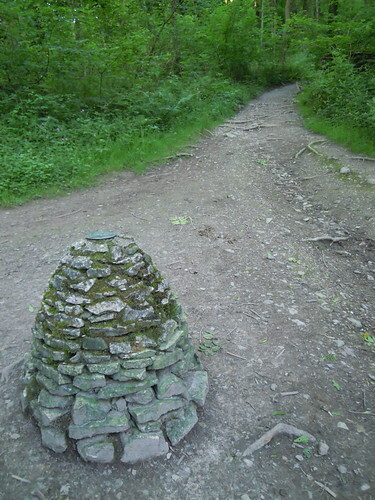 But, I couldn't visit Arnside without a wee peek at the English version of Faeries with their Steps. And it seems, it's rather well known about. 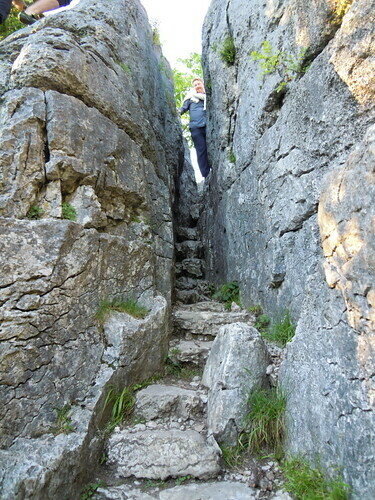 There is a natural fault line running through Silverdale from the rock escarpement, and a natural fissure has had the help from men with hammers and other such manly tools that leave me with glazed eyes, to create these steps to walk up and down. It is proof that good food creates a strong, tall nation of people, because to fit though this fissure, you have to be lean, and I only just fitted going side ways, goodness knows how coffins were pulled up through this gap! Small, lean people they had to be. Then again, maybe they were just shrouded and not in a coffin at all, they were after all the poor folk, as the richer went by horse and cart/carriage along the road. Because in the days of old, that was the route that was used to move the 'departed' from the lower part of the village to the church, (well, dragged up I expect), it is known locally as the 'Corpse's Trail'. According to legend (Ah, knew there had to be one of these!). If you can squeeze though the gap and not touch the stone walls, you get your wish granted by the very generous Faeries, who I think were onto a winner here, cos there was no chance of getting though, especially, if you had eaten at the superb Wheatsheath Pub in the nearby village of Beetham first – http://www.wheatsheafbeetham.com/index.html – without getting a good daubling of wall dust on your jumper in proof of a good substantial dinner residing within you. 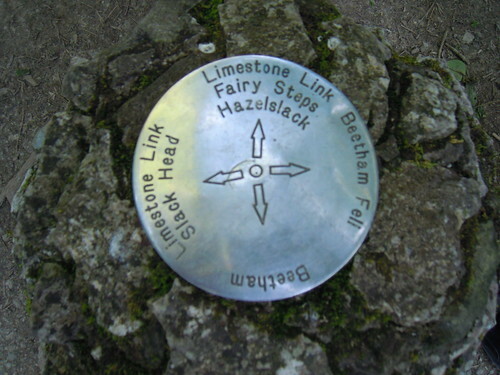 After a fabulous walk of the Fairy Steps followed by a rather brilliant meal at the Wheatsheaf with Ali, I bedded down to rest in Arnside, the following morning, I slipped out of the Youth Hostel there, at an early time, and headed for Windermere. I had Youth Hostel accommodation booked there as well. 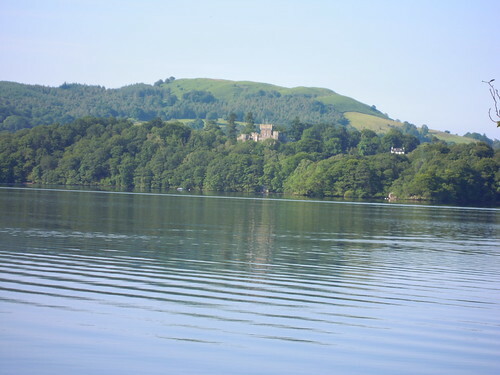 I was advised by the caretaker there, that it would be unlikely that I would be able to drop off my luggage before 4 or 5pm at Windermere, as rooms were to be cleaned etc. So my first lake tour of Beatrix Potter and her life and times would be with laden bags and panniers... ah well... its good for the legs. Beatrix's female equivilent would be lashed to the sides of their men folk, they owned nothing having given it all away on the day of their wedding. To me, Beatrix has been a great inspiration, she walked the path few from her class and era walked. She is best known of course for her children's books. But I am more interested in finding out about her gift as a painter, her skill as a shepherd and in her youth as a mycologist. Beatrix's father was an influential chap, and got her access to Kew Gardens and she became a scientist and an illustrator of mycelia and fungi. Her art in this area was very three dimentional, created with feel, love and real skill. Even today, her drawings are so accurate that rare fungi can be identified from her pictures. She was one of the first people to conclude that fungus grew from beneath the ground via its long threads as well as from spore Her paper entitled 'On the Germination of the Spores of Agaricineae' was never published. It was rubbished at the time, likely due to her gender and inexperience, but later found to be a fact. Her hand made folders and paintings of fungi can be seen at the Armitt Library in Ambleside, it was a delight seeing her work in the flesh. Beatrix, was outside the usual mould of the rich Victorian Lady. Her family visited the Lakes each summer for their holiday break. Beatrix grew to love the Lake District, intially as a holiday retreat and eventually as a bolt hole. 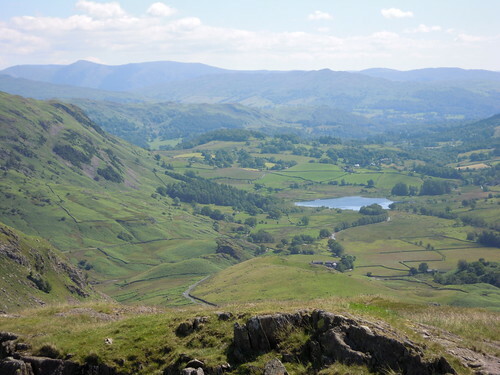 As a result of the success of her story books, she became a woman with an income of her own, and following the death of her much loved Norman Warne, she came to the Lakes to live, having purchased her first farm at Hill Top. She was one of the first farm owners to encourage diversity and to open a tea shop to top-up the income from farming... (Yew Tree Farm) which as it happened years later also became the film prop for Beatrix's own Hill Top farm where she lived with her husband until her death in December 1943. When she died, she left to the National Trust 14 farms and 4,000 acres of land. I had a splendid time finding out about Beatrix, her life and times, the above is just a snippet. Photographs of Hill Top and of Yew Tree Farm are found in the album I have posted on YouTube. Sorry again about the music... not my fault ok, not much nice choice from the You Tube library. It includes my Beatrix Tour and my cycle tour with Tina. I met Tina at our B&B in Hawkshead, a very attractive village and lucky for us, it had a nice arrangement of good eating public houses. Our first morning was a bit hectic, and mid morning we met up with some of Tina's friends who lived in the Lakes. We put ourselves in their capable hands to sort out a nice route, and a coffee stop. They didnt disappoint us. And we set off at a cracking pace. I had managed to strain my knee the Monday before doing stupids like cycling as fast as i could to Ramsey and back, and boy did it hurt.... I was on anti inflammatories for the entire trip, as I had to cycle, but didnt want to further injure it. Carbon bikes like a good gallop. My knee and Hettie were not really up to it, but I surprised myself and managed. Just... We did need to shorten the ride by 20 miles though, as Tina and I were cycling up Wrynose the following day. My Garmin is playing up, and it recorded not only where we cycled that day, but where I had been the two previous ones too, so I have not put it on here, as it looks like we cycled continuously for 3 days whereas it was nearer 34-40 miles. But they were pretty hilly miles too. I enjoyed the days cycling. The roads were quiet and narrow, scenary was second to none, what a smashing place the Lakes are. Glad to have been there before school holidays though, as the bigger roads got very plugged with traffic. Sunday, was Wrynose day. Tina and I breakfasted quickly and were out and about nice and early. Only the birds had a better view that day, the weather was superb, views equalled the weather. At the bottom of Wrynose Pass we stood beneath the 30% signage for the hill ascent with awe! The biggest one yet... We set off. Knee was behaving so long as I babied it, and so I pulled up instead of pushing down and it helped the pain. The first bit, wasn't so bad. Much like the roads at home. In fact most of Wrynose was like cycling up the Sloc road on the Isle of Man. We passed very slowly small villages, that eventually emptied out into a single tracked lane with passing places. There were loads of cars going up, and coming down. Tina and I were careful not to photograph them, as they spoilt the nice views! As we neared the top it was obvious that things were getting steeper by the smell of clutch plates, and the number of cars that were stalling. Scary stuff, I would not have had the bottle to drive up it. Eventually we reached a point where our rear wheels simply no longer had traction and our pedals slipped down, threatening a 'Timber Moment'. At this point, we walked. We were nearly at the top anyway. We spotted a couple of cyclists who were going to complete it without a walk, and they did so by using the entire track and sort of zig zagging, but the cars did get in the way to do this properly. After Wrynose Pass, we had a choice, to turn left, or to tackle Hardknott, which was another 30% hill, this time with hairpin bends. It was almost nose to tail traffic by this time (lunch) and with a rumbly tumbly, we took the left choice and were soon cycling downhill on lanes occupied only by ourselves. We stopped off at a very nice pub for a bowl of homemade soup, before continuing into Foxfield, and Broughton Furness. From the railway line we could see a steep road looming upwards... and yes, it was Beck Side, and yes, that was in our direction.. so up we went. We were back at the B&B for 6pm and we both slept rather splendidly that night. 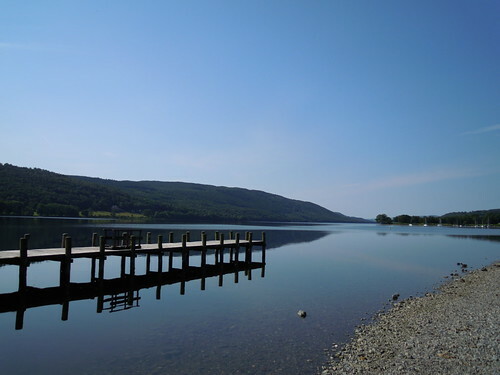 Monday, and Tina was going home, but not before a trip to Coniston Water for a kayak tour. It was great fun. I'm not much of a brave person, and those boats wobbled a bit, but thankfully as you can see, the day loomed warm and calm again. It was the perfect ending to a perfect few days away. A hilly 5 miles to the lakeside, and then 3 hours on Coniston Water, with just Tina, myself and our guide. It was fantastic to be honest. I was a bit daunted on the distance we ended up kayaking, and my arms and shoulders paid for it the following day, but it was well worth it. Like mountain biking, by being on water you get to see the parts you would have other wised missed. It was one of the best trips to date. Great company, superb weather, it didnt go below 20 degrees for the entire trip, the rain came down just as I got to the car park of the Steam Packet for the ferry home, how great was that. Posted by Mary on July 8th, 2011. You were jammy with the weather — it always rains or snows whenever I'm up there, except for my first visit to the Drunken Duck in the long hot summer of 1976. Yes, wonderful – the slide show too (and the photos of course). All I know about Beatrix Potter is from the 'Miss Potter' movie, which I enjoyed (although I thought Ewan McGregor was miscast). She's a national treasure. 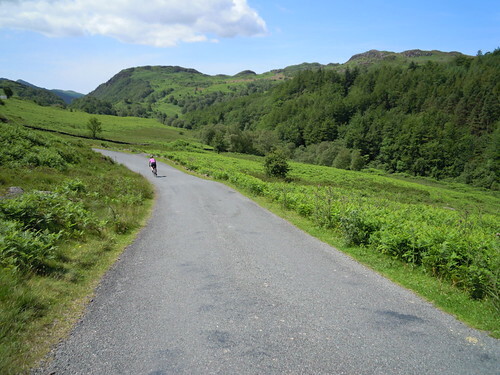 I've never thought of the Lake District as a particularly good place for cycling but I might change my mind! I'd like to try Wrynose and Hardknott, and also Honister Pass which I know quite well. I'm pleased your knee survived BTW. We were indeed very jammy indeed with the weather, especially as this has been one of the worst summers I can remember. The Lakes is awash with small tiny single tracked roads, missed by a lot of traffic slavishly following their gps. Tina and I got there on this particular weekend, as it was a Bank Holiday on the Island (Tynwald Day). Not for one moment would I ever go there during school holidays. I have been told its gridlocked a lot of the time. ON the little ferry to cross Windermere, there where huge signs telling traffic how long they had to wait, starting at 2 hours, and going down to 20 minutes. I didnt have to queue at all, no traffic as it was a normal working week for most folk. It got a bit busy on the Saturday and Sunday, and Wrynose had just enough traffic not to be a pest, but by lunchtime Hard Knott was nose to tail cars, which decided our route that day. There certainly is a lot to do and see when the sun is out. We intend to return next year, and complete Hardknott and see other parts, I would like to cycle Cats Bells.... that sounds nice. (cat fan here). Scotland isnt far away Tina. Got lots of planning to do over this winter. 🙂 A great holiday improved by great company. Sounds like a smashing trip. 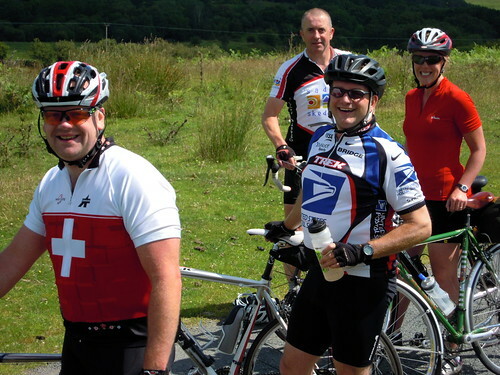 I used to do a lot of cycling and camping in the Lake District. That was almost 30 years ago (gulp!) and it was busy then. 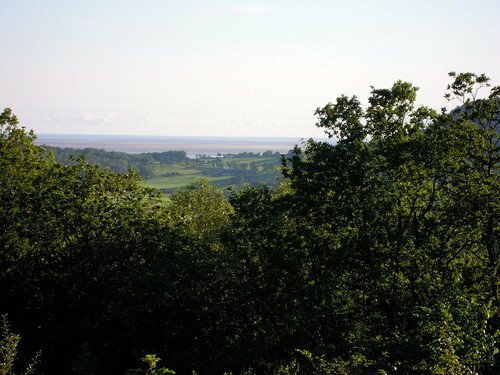 Arnside and Silverdale is a beautiful area too – I did a long spell there as a volunteer at the RSPB reserve at Leighton Moss. Also about 30 years ago! I didn't know Beatrix Potter was a mycologist. She was obviously a remarkable woman. What a great spot for cycling. You certainly chose the right roads (one lane) and missed the traffic. I'm not sure about that 1-in-3 hill though – I'd be walking up that one all the way. I always enjoyed Beatrix Potter. My favourite story was Jemima Puddleduck, particularly because the ending avoided the cloying happily-ever-after formula. It was much closer to the life's realities.